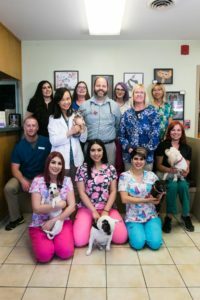 Our team, including, Dr. Penelope Bowden, Dr. Yuan Kang, and Dr. Kevin Nagel, is here to serve you at Lincoln Avenue Vet Clinic in San Jose. We hire only the best and most experienced employees to become a part of our team here at Lincoln Avenue Veterinary Clinic. Our team is filled with highly dedicated animal lovers who are well trained at their jobs. We will do anything possible for our patients and the owners who love them! Learning and education are very important here at Lincoln Avenue Veterinary Clinic. We strive to have a state of the art hospital with a staff trained in the latest medical advances because our patients deserve the very best veterinary care. Basically, our team is full of animal lovers. We make it a goal to treat each patient like our own and give each patient plenty of love and attention. We are prepared to discuss preventative medicine so that every pet can stay as healthy as possible. We will also do everything we can to make a sick pet feel better as soon as possible. If you would like to speak to someone on our team, don’t hesitate to contact us today at (408) 293-3448. Dr. Bowden was born in England but grew up in southern California. She graduated from U.C. Davis with a degree in Biochemistry and from University of Georgia with her D.V.M. degree. She worked in Houston Texas for 2 years before moving back to the Bay Area in 1993. She started working at Lincoln Ave in July 1993, and we love having her here. Dr. Bowden is married, has three sons, and shares her home with numerous dogs. She enjoys the outdoors and regularly competes in Spartan races! Dr. Yuan Kang grew up in Boston and always knew she wanted to work with animals and their families. She studied molecular biology at Yale University and received her veterinary degree from Cornell University. Her professional interests include surgery, dentistry and geriatric medicine. She also enjoys working with animal shelters and underserved communities. Dr. Kang is Fear Free Certified and tries to make visits as low-stress as possible for her patients. 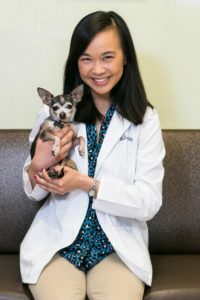 She is a member of the California Veterinary Medical Association (CVMA) and the American Veterinary Medical Association (AVMA). In her free time, Dr. Kang loves exploring local restaurants and hiking trails. She has two adorable guinea pigs, Machu and Picchu, and a rescue Chihuahua, Dobby. Dr. Kevin Nagel grew up in upstate New York and always had dreams of winter sunshine. 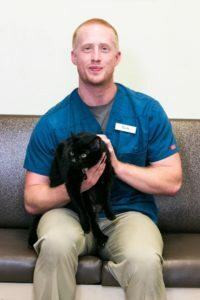 He attended Cornell University for both his undergrad and veterinary degrees and graduated with his DVM in 2009. He promptly moved out the Bay Area where he worked for a year on the coast before coming to LAVC in San Jose. He has broad professional interests, including general small animal (dog and cat) medicine and surgery, eye issues, clinical pathology (looking at stuff under microscopes) and dentistry. 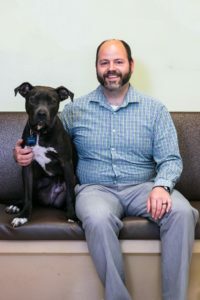 He does his best to encourage the human-animal bond and believes in LAVC’s practice of having pet owners be an integral part of making decisions. Dr. Nagel is married and has a cat named Darwin and a dog named Indiana. He enjoys brewing his own beer, hiking, camping, reading James Michener books and watching such varied TV shows as Game of Thrones, Orange is the New Black, and Cheers. Cyn is our Practice Manager. She grew up in South Dakota, where she was raised as a farm kid to respect all walks of life. In 2000 she met her husband, Jason, who is a computer genius. When Jason’s career advanced, they moved to Philadelphia, PA in 2007 and to the Bay Area in January 2015. 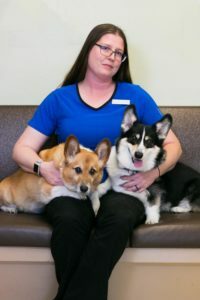 Cyn earned her bachelor’s degree in Biology and Animal Science at the University of South Dakota and advanced to her MBA at Delaware Valley University, all while working as a veterinary nurse at various clinics and hospitals. 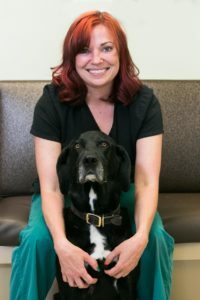 Cyn has over 18 years of experience in the veterinary field, 8 of which were in a supervisory or management type role. Her clinical experience and MBA training have provided Cyn with the skills and confidence to lead the LAVC team towards their future goals. Cyn is a very active person who enjoys being outdoors hiking, running, and working out; but her passion is being a horseman. If she has a few free hours, chances are she will spend that time at the barn or getting lost on a trail with one of her 3 mares. Her other fur children include two corgis (Red Dog and Duke) and two cats (Midian and Anon). Juan (Jay) is a San Jose native and has been grooming dogs and cats in the area for over 11 years. When he started his career at PetSmart, Jay found that he could combine his artistic abilities and his passion for dogs as a dog groomer. After grooming school and years of practice, Jay has become a pro in breed-specific cuts and special requests. He treats each patient with compassion and gentle handling, taking breaks when needed to get the job done with minimal stress. When not grooming dogs, Jay loves to spend time with his family and many fur babies. You can also catch him at the movie theater with his fiancé watching the newest flicks. Evangelina is our front desk supervisor. She was born and raised in San Jose and started her career teaching kindergarteners and first graders. EV grew up with animals but could not have pets once she had her own children. 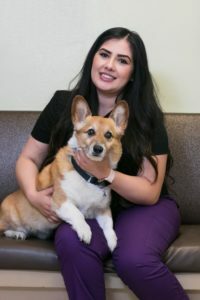 In order to fill the void and to be with animals, Evangelina started working for LAVC 5 years ago. She started working as a receptionist and has blossomed into a supervisor. EV loves spending her days off with her friends, family, husband and 2 kids. When not owning the front desk, Evangelina enjoys drawing, painting and doing DIY projects (although we don’t know where she finds the time to do so!). Karissa is our veterinary nurse supervisor. 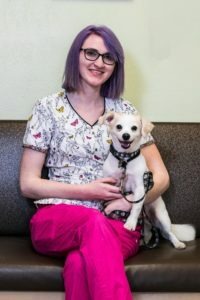 She has been in the veterinary field for 8 years and graduated from Carrington College in 2011 with an associate’s degree in Veterinary Science and Technology. Ever since she was very young, all Karissa thought about was animals and wanted to work as a veterinary nurse. Her fur babies Remedy (Chihuahua) and Gizmo (cat) are her pride and joy. Karissa is a very active person. When she is not treating pets she loves to be outdoors, working out, hiking, and shopping. Who doesn’t like to shop? Emily discovered her passion for veterinary medicine when she started as a kennel assistant in 2010. 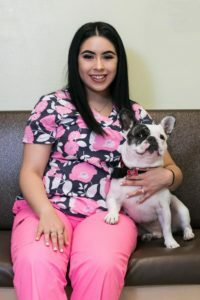 Soon after, she became a certified veterinary assistant through Foothill College and plans on going back to school to get her RVT in the near future. The skills that she acquired with her Fear Free training, here a LAVC, allow her to keep pets as comfortable as possible in high stress situations in and out of the clinic. Emily loves working with a variety of pets including dogs, cats, and even rats! 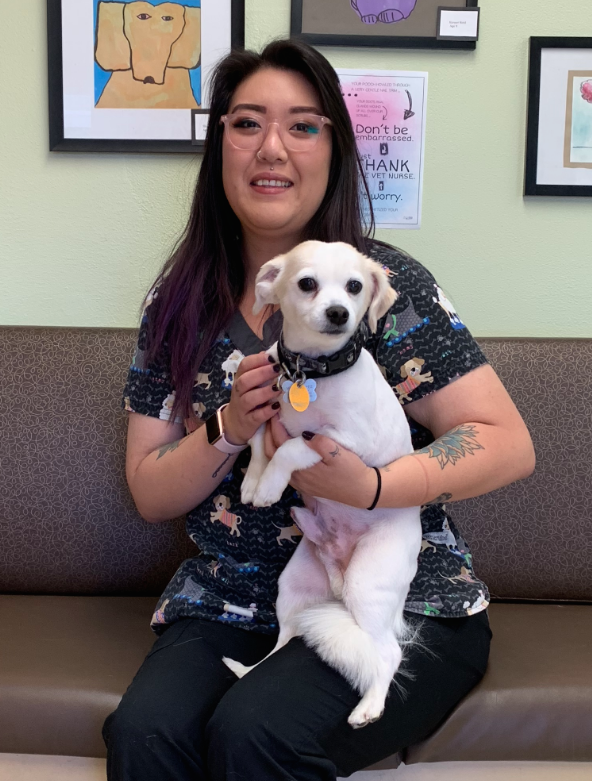 After working in a busy veterinary clinic all day, Emily enjoys spending quiet, low key, down time at home with her husband and their two fur babies Mugzy (dog) and Boots (cat). She is also an avid gamer and loves to read. Emma grew up in Las Gatos and recently moved to San Jose. Animals have always had a special place in her heart. While in high school, Emma found her love for science, so she found herself combining the two in the veterinary field. Emma is enrolled in classes for her RVT and loves working with animals of all sizes. During her free time, Emma enjoys exploring the North Bay with her fiancé or snuggling on the couch with her many fur babies watching movies. Heather has been working for LAVC since she received her associate’s degree in Veterinary Technology from Carrington College in 2016. She is studying hard to pass the national boards and get her RVT. Heather enjoys working in all areas of the hospital, but her strong suit is animal dentistry. She does exquisite cleaning and is a master at dental radiographs. A San Jose native, Heather loves to spend time going down town with her friends or family. 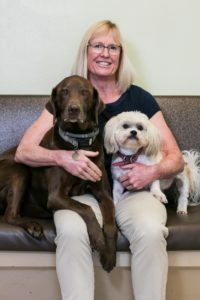 When at home, her favorite pastime is snuggling on the couch with her fur beloved babies, Brownie (Lab) and Toffee (terrier mix), while watching reality TV. Scott is a pet and animal devotee. After working with animals in a professional setting since 2010, he has developed a special interest in timid and aggressive animals. Following many years of working in numerous different environments, Scott has recognized how significant it is to have somebody care for their loved ones. 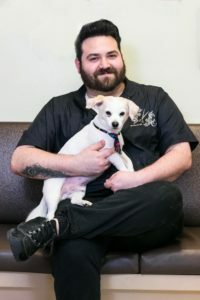 When he’s not working as a technician at LAVC or operating Wagtopia (his doggy daycare company), Scott can be found lounging in the sunspot of his living room with his little terrier mix and shadow, Arizona. Ally is a Texas native and grew up in Austin. She began her work in the animal industry in 2002. 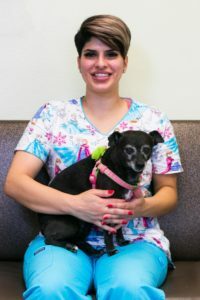 After working at different veterinary, training, boarding and daycare facilities, she moved to California in 2008 to get an associate’s degree in Exotic Animal Training and Management. With a long-term goal of being part of wildlife rescue and rehabilitation, Ally continues working in the veterinary field. She enjoys learning about veterinary medicine and helping pet parents learn more about more about caring for animals as well. Ally has a Rottweiler, a German Shepherd and a cat who she spends as much time with a possible. Her favorite pastimes are going to the lake with her dogs, camping, listening to live music and getting crafty. Lissandra was born and raised in San Jose. She has wanted to work with animals since she was a little girl and hopes to one day start her own non-profit rescue. She enjoys every minute she gets to spend around animals and is dedicated to giving the best animal care she has to offer. When not up front working reception at LAVC, she’s watching a movie or playing video games with her boyfriend, pet sitting/dog walking, hiking with her two pups Joanie and Lola, or eating out with her friends. Liz was born in Los Gatos and then moved to Mexico for 3 years before she settled in San Jose. From a young age, Liz knew she wanted to work with animals. When she lost her best friend and beloved dog, Bambie, she was motivated to start her career in veterinary medicine and dedicated her life to working with pets and their owners. 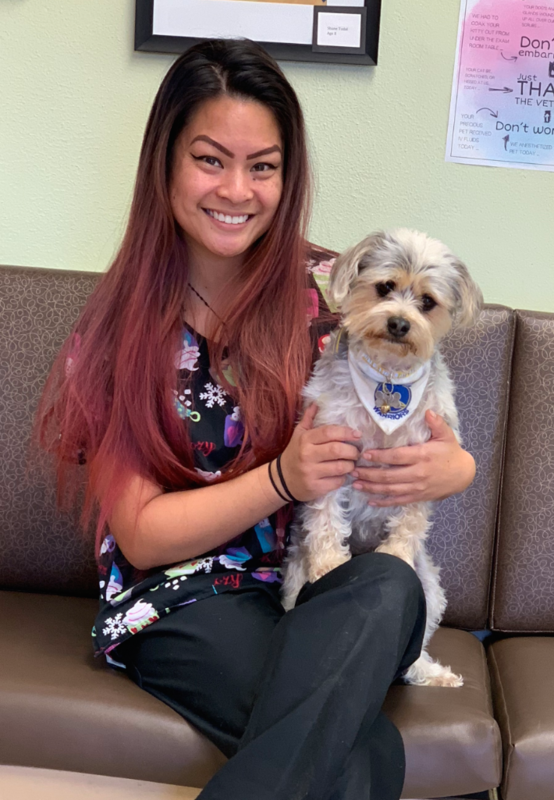 Before working for LAVC, she received her veterinary assistant certificate through Silicon Valley Career Technical Education and an internship at a local veterinary clinic. When Liz is not working hard to help our clients, she enjoys pet sitting, traveling, spending time with her family, going to music festivals with friends or just kicking back and watching movies with her cat Kenny (who by the way is a foster fail! ).